We as Christians have just received a new life which is that of God who has come into this world as one of us, in order to cleanse and save us by showing the way of salvation. In the same way that Christ and His Incarnation was foretold by the Prophets of old so also, St. John the Forerunner had been anticipated by the Prophets. He and his work had been predicted – that he would “prepare the way of the Lord”. He would be the Forerunner and Messenger of the Divine Incarnation; he would preach in the wilderness and would shout out to the masses to prepare their hearts to welcome the Messiah. He would be the “voice crying in the wilderness, prepare the way of the Lord, make His paths straight”. Which is this way, this “path of the Lord”? It is the heart of each and every one of us, which must be opened, freed from the obstacles which make it impassable and inaccessible to God. These obstacles are weaknesses, passions, selfishness, the darkening of the mind through errors and superstitions, the inherited inclination to, and tendency for, sin and the variety of selfish habits. 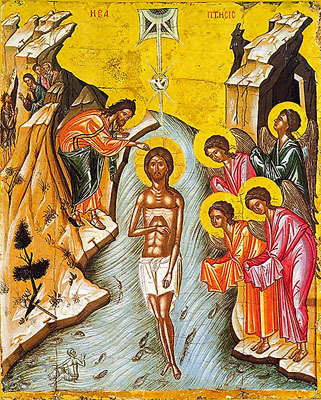 When John the Baptist witnessed and said about Christ, “Behold, the Lamb of God, Who takes away the sins of the world” (John 1:29), and when John immersed and baptized the Lord in the Jordan, the mission of Christ in the world and the path of our salvation was shown. That is to say: The Lord took upon Himself the sins of mankind and died under them [immersion] and became alive again [the coming out of the water]; and we must die as the old sinful man and become alive again as cleansed, renewed and regenerated. This is the Savior and this is the path of salvation. It is all these things that make the way through which the Lord will pass impassable; they make the heart unfit for the Lord to visit and to make it a stop on His salvific path. It is this heart which, with His graceful help, we must purify, rid it of passions and weaknesses, adorn it with virtues, make it honest and straight, so that God can “walk in it” and stay in it. However, the hearts of people around us are also “the way of the Lord”. St John the Forerunner was sent to the people of his time to prepare them to welcome the Lord. In this same way, today, the faithful are sent by God to contemporary people in order to cultivate in their hearts the desire for salvation, to announce to them the Saviour, God, who became Man for our sake. There are still many obliging and helpful hearts around us today, despite the materialism and rebellion which prevail in our society, despite the currents of anarchy and immorality. Many are those who are waiting for someone to speak to them about Christ and the Truth. We must not forget what the Apostle Paul says, that “we are God’s fellow workers” and the tools of God in the work of the Gospel, for the spiritual guidance and preparation of our brothers and sisters (1 Corinthians 3:9). A kind word in the appropriate situation, a constructive book, a visit during an illness and, above all, our good example, are God-given means whereby we can prepare the way so that God can visit our brothers and sisters. For all in that road by Grace, which comes through Baptism, true commitment becomes an experiential life of holiness that turns any apostate into a saint.